Bigger and bigger media files (up to 4K), more and more photos and selfies may block up the iPhone storage, this is why you need to transfer files from iPhone (XS/XR/X/8/7) to computer. The latest iPhone models all support 4K video shooting and 12-megapixel camera, including iPhone XS/XS Max/XR/X, iPhone 8/Plus, iPhone 7/Plus, 6s/Plus and SE. And even the biggest 128G storage is not able to store much HD video, music and images. 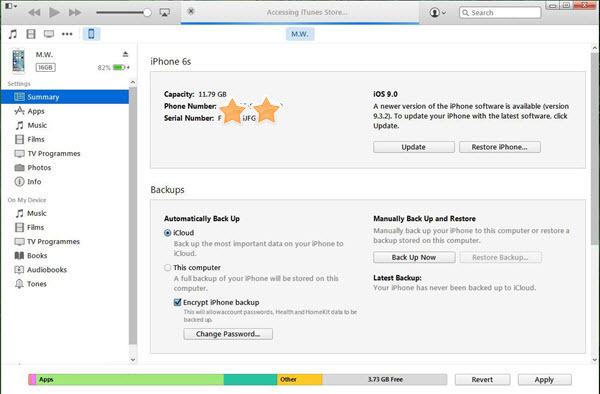 Therefore, it's a regular action for iPhone users to remove and backup some not-so-unnecessary stuff from iPhone to computer, emptying more space out. We don't suggest users deleting massive media files directly, which may take some crucial and memorable files away. - Fast transfer files from iPhone to Windows (10) PC or Mac OS X. - Embrace various files of video, music, photo, e-book and more. - Perfectly support managing/tranferring files on iOS 7 - iOS 12. Download the Windows or Mac version to get the iPhone media files transferred to PC/Mac. Step 1: Download iTunes of the latest version, install and run it on your computer. Step 2: Connect iPhone to computer with cable, and iTunes will automatically recognize the iPhone. Tap "Trust" option on iPhone to trust this computer to access to iPhone files. Note: The other several options at Settings area allows you to sync apps, music, films, TV shows, photos (only from PC to iPhone) and more. Step 4: If necessary, you can do some content syncing settings, and press Apply button. Step 5: All things done, click Sync/Apply button to start backup iPhone files into PC. If you wanna sync your iPhone files to iCloud for computer viewing or so, also do the first two steps above, and then check "Sync with this iPhone over Wi-Fi" at the right bottom "Option" column, then disconnect the USB cable, select file items to sync, and press Sync at last. With the most advanced hardware acceleration tech built in, WinX MediaTrans, as the best way of iPhone file transfer, is able to transfer whatever files from iPhone XS (Max), XR, X, 8 (Plus), iPad Pro and iPod series to PC within the shortest time, which is 3-5x faster than common file transferring tools. Plus, music song files, and playlists are all available to edit as you like. ● iExplorer: It is recognized as the most popular iPhone file manager,and maintains the basic function such as transfer files between iPhone and PC, backup media files, etc. ● iMazing: It is an all-purpose iPhone file manager that almost covered all files on iPhone management. WinX MediaTrans, a new face among the iOS file transferring software market, holds the fastest speed in copying photo, movie/video and music files from iOS based iPhone models to Windows (10) PC. Through real testing, it only takes several seconds to finish exporting 100 4K photos by WinX MediaTrans, but about half minutes by other general tools. Step 1: Plug in iPhone to computer via USB cable . Step 2: Free download WinX MediaTrans on Windows (10) or Mac computer. Since iPhone has been connected to computer, the main software interface will pop up automatically. Step 3: Select photo, music or video files at correspondent section. Good to tell that music files can be edited and added to existing or newly created playlist, and videos can be converted by default to fit for playing perfectly on computer. Step 4: Click "Export" or "Sycn" to transfer those selected files off iPhone (XS/XR/X/8/7/6S) directly into computer. Rip any DVD for iPhone, iPad & Android. Convert DVD to MP4, AVI, MOV, ISO, etc. Convert 4K/HD/SD videos to any formats. Download videos from 300+ online sites. If you are the one who are tired of seeking for iTunes error fixes over the internet to successfully sync iPhone files, we would like to share a solid and stable way of iPhone file transfer without iTunes. Get the easiest way to transfer MKV files to iPhone 8 or the elder, while removing the MKV playback limitation on iPhone. No video converter or player needed at all. When you wonder how to transfer large videos, photos or other files from your iPhone(Xs/Max) to PC, check 3 common ways to choose the one that fits you most.